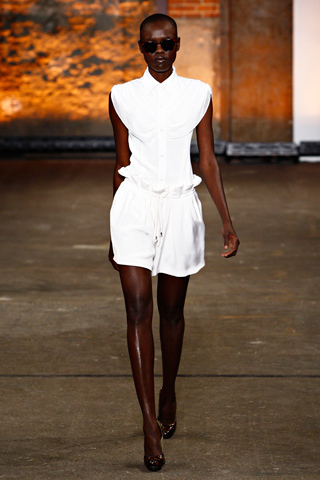 I always think the following at every Siriano New York Fashion Week show: he can be a major American designer someday. What, he already is? No, I'm not talking post-Project Runway major, I'm talking Bill Blass/Geoffrey Beene major. Each show there is something on his runway that takes my breath away and I think yes, he's capturing a very American look that communicates glamour through simple, clean styling. 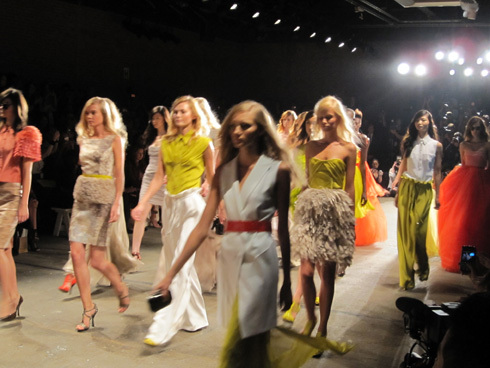 One of my co-workers attended the Spring 2012 Siriano show for me as I was having toddler care issues (as in I have one, and I needed to take care of her). My colleague sat in the second row and captured some lovely bad iPhone photos. I see good, and I see not so good. But anytime there's a troop of models on a mile-wide runway, it usually all looks pretty good. "Chartreuse lemon white everywhere. With crepe. Sheer layers. 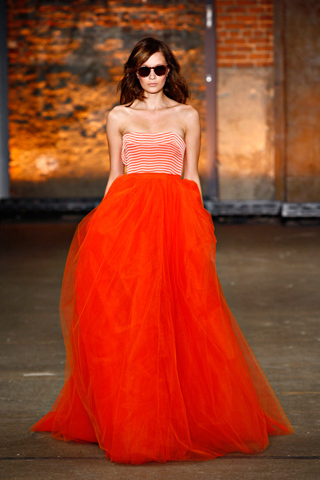 Sunkist to the t."
"So coppertone fun amid a few stripes with ball gown skirt for measure." I totally get it. And again, I thought "so American," although that could be due to the Coppertone mention. 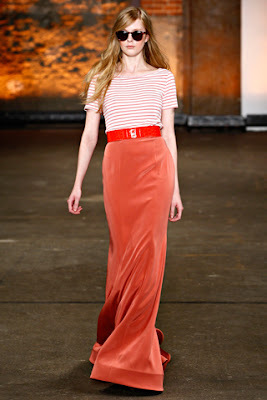 I'm not saying Siriano always gets it right, but I'm usually not upset to see where he gets it wrong. Kind of like when Mark Sanchez throws two interceptions in a game the Jets win, I'm thinking "Yes, let him pass the ball and screw up now, please, in the beginning of the season, but not play bad enough to lose the game." And while you peruse this metaphor I'd like to throw in the Sanchez GQ cover. I mean, seriously. 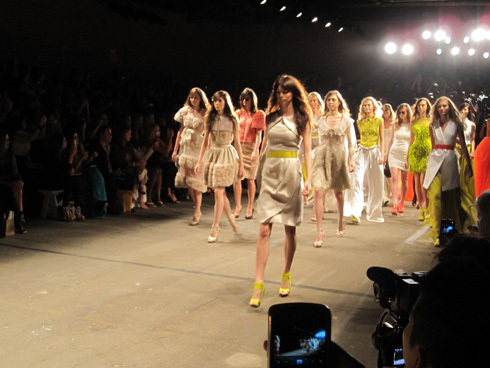 Unlike Christian Siriano, I really hope Mark Sanchez doesn't become a regular at New York Fashion Week. A show here and there fine, but I don't want to see him posing with CW stars, OK? Now some official photos, namely the looks I loved. 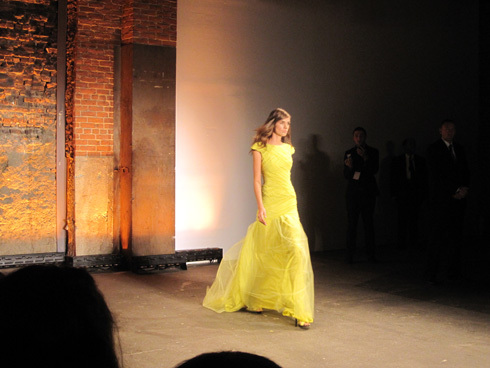 I wouldn't say I found the show as a whole to be an overwhelming success, but again there are pieces that keep me looking forward to the next Siriano iteration. 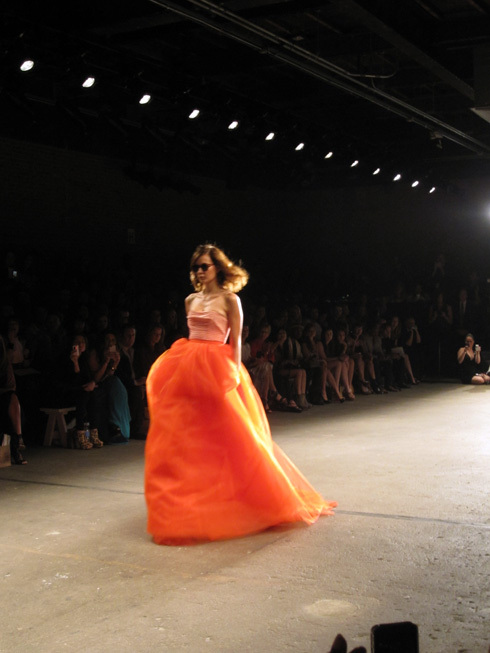 Just as much as I want Mark Sanchez to be the next Broadway Joe, I want Christian Siriano to be the next Bill Blass.